We have selected Dubai as the location for our 2016 Annual Network Meeting. Dubai can be reached within 8 hours from Europe, Africa and the Far East, and in less than 15 hours from the USA, Japan or Australia by over 7,000 weekly flights operated by 140 airlines to over 250 destinations. Dubai is one of the safest cities in the world and our meeting will take place from 17-19 April 2016 at the Radisson Blu Hotel, a luxury hotel in the heart of Dubai’s bustling business district and shopping center. The hotel is just 7 kilometers from the Dubai International Airport and offers easy access to all of the city’s attractions and entertainments. On the evening of Sunday 17 April we will gather to collect name badges, meet fellow delegates and enjoy a Welcome Reception at the Pool Deck, with stunning views of the Creek and City Skyline. We will then make our way to the Plaza Ballroom for an elegant Gala Banquet with a Jazz Band. 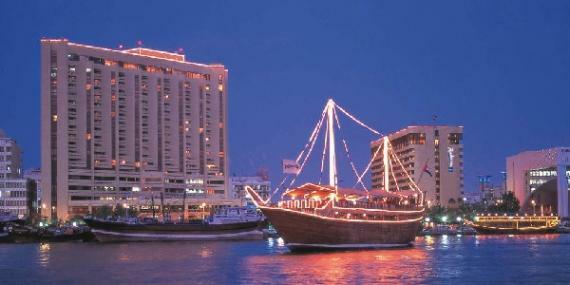 Our evening excursion after our first full day in the meeting room will be an Exclusive Dhow Dinner Cruise. Upon arrival we will receive a red carpet welcome with cold towels, fresh dates and Arabic coffee. We will then enjoy a two-hour cruise on a traditional wooden dhow with an international buffet dinner from a 5-star hotel catering team. The above rates are inclusive of 10% tax and 10% service charge but are subject to additional AED 15.00 Tourism Dirham fee per room per night. Breakfast is inclusive and offered in the Boulvar Restaurant. All rooms are with private balconies and stunning views of the creek and city skyline and include complimentary high speed, wireless internet access. Airport transfers from Dubai airport are pre-bookable at AED 100 per car per way (approx. $27).